The November 2018 meeting of the Trade Unionist and Socialist Coalition national steering committee has agreed to suspend all TUSC electoral activity until further notice. The TUSC name and logos can still be used in campaigning activity by local TUSC groups and the coalition's component organisations, but from now on the legally required certificates of authorisation needed for the TUSC name and emblem to appear on election ballot papers will no longer be issued by the TUSC national election agent. This decision follows a period of discussion within TUSC around proposals submitted over the summer by the Socialist Party, one of the founding organisations of the coalition, to re-set the role of TUSC three years after the election of Jeremy Corbyn as Labour Party leader (see http://www.tusc.org.uk/txt/425.pdf). All the component parts of TUSC remain firmly committed to continuing the fight against austerity policies and the politicians from whichever party who implement them. This includes campaigning against right-wing Labour councillors who undermine Jeremy Corbyn's anti-austerity message by voting in the council chambers for cuts to local public services. TUSC will therefore continue to publish the detailed information on council reserves, and guidance material on how to prepare no-cuts 'Peoples Budgets', that has played an important role in aiding trade unionists, socialists and working class community campaigners to fight for a real anti-austerity stand by their local councillors. Where there is not agreement, however, is on whether this campaign should extend to challenging right-wing Labour councillors at the ballot box in the May 2019 local elections, and it is this which underlies the steering committee's decision to suspend electoral activity. TUSC was established in 2010 to enable trade unionists, community campaigners and socialists from different parties and none, to stand against pro-austerity establishment politicians under a common banner and an agreed platform of core policies, periodically debated and revised at TUSC conferences. Within that framework TUSC-authorised candidates were free to run their own campaigns and around 2,500 have done so since 2010, polling over 375,000 votes between them. All the component parts of TUSC remain proud of that record and the inclusive approach the coalition has pioneered in its nine-year existence (see TUSC Timeline below). But at the November steering committee the representatives of the RMT transport union, another component organisation of TUSC, were unable to commit the union to authorising any TUSC candidates to stand in next year's local elections, even on the selective basis - against Blairite opponents of Jeremy Corbyn who are implementing austerity - that has operated in the past three years. The union's special general meeting in May 2018 had decided not to re-affiliate to the Labour Party at this stage and instead to continue with its current independent political strategy. This includes retaining RMT representation on the TUSC steering committee and supporting election candidates that support the union's policies. But with the extremely volatile and fluid situation in British politics the RMT reps could not take a definitive stance on whether or not the union would use its position on the steering committee to approve applications from prospective TUSC candidates to stand against right-wing Labour candidates in next May's council elections. The Socialist Party representative indicated that, if there could not be an assurance that TUSC candidates would be authorised to stand (on the previously agreed selective basis and subject to the usual scrutiny procedure for applications), they would stand candidates next May under a separate banner. On this basis the steering committee agreed to suspend TUSC's electoral activity until further notice. ■ Early in 2009 the No2EU:Yes to Democracy coalition is established to stand candidates in the 4 June European parliament elections on a platform of opposition to the EU's neo-liberal agenda. The coalition involves the RMT - with general secretary Bob Crow heading the candidates' list in London - the Socialist Party, the Communist Party of Britain (CPB), Scottish Solidarity, and others, including convenors and leading activists from the Visteon plant closures and Lindsey oil refinery construction workers' disputes, prominent industrial struggles of that year. ■ No2EU stands candidates for all eleven regional lists and polls 153,236 votes. With the RMT's formal backing this was the first time a trade union had supported a national electoral challenge to Labour since the formation of the Labour Representation Committee in 1900. The coalition participants continue to meet in the summer to discuss how the successful model of co-operation between different forces could be continued and a common platform of core policies agreed for the general election due in 2010. ■ Resulting from a resolution at the RMT annual general meeting (AGM) a conference to discuss working class political representation is hosted by the union on 7 November, at which it is announced that a federally-organised coalition has been agreed which will stand candidates in the coming general election (with the name still to be finalised). Speakers at the conference include Bob Crow, Joe Higgins (Socialist Party Ireland MEP), Dave Nellist, FBU general secretary Matt Wrack and... Jeremy Corbyn! On the issue of working class political representation the then backbench Labour MP says "there has always been a debate, in or out of the Labour Party, but what we can agree on is the need to stand up against war and poverty". ■ The POA executive discuss the proposed electoral coalition at its 16 December meeting. While deciding that the union would not officially participate, they agree that individual members and officers can do so in a personal capacity. The then general secretary of the POA, Brian Caton, declares his support. ■ The Trade Unionist and Socialist Coalition is formally founded on 7 January, with an initial steering committee including the Socialist Party and, in a personal capacity, Bob Crow, Brian Caton and PCS assistant general secretary Chris Baugh. Places are reserved for other socialist organisations who may wish to participate. Dave Nellist is registered with the Electoral Commission as the legally required 'party leader'. ■ Later in January NUT president Nina Franklin and PCS vice-president John McInally join the steering committee in a personal capacity, and the SWP join as a participating organisation. A founding meeting of Scottish TUSC is held at the RMT Scotland HQ on 30 January, also attended by Bob Crow and Dave Nellist. The CPB executive, however, votes narrowly not to take up its place on the TUSC committee, albeit while agreeing to support two TUSC candidates in the general election, Dave Nellist and CPB member John Metcalfe. TUSC stands 42 candidates in the 6 May general election and 33 in the council elections held on the same day, polling a combined vote of 23,580. ■ Following the May elections an open conference of TUSC candidates and agents is held on 12 June where it is agreed that TUSC will continue to stand candidates and establish local steering committees in preparation for future contests. The RMT 2010 AGM approves the executive's political report on the general election, including the union's formal endorsement of 21 TUSC candidates in May. At the end of the year the steering committee agrees that Nick Wrack, the former secretary of the Respect party, should organise a national meeting of independent members of TUSC (those not in the constituent organisations) to formalise their involvement in the federal coalition. 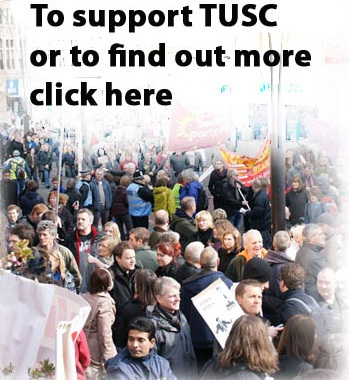 ■ A TUSC conference on 22 January agrees the core policy platform for the 2011 local elections. While candidates are to be responsible for their own campaigns and election literature, agreement with the core policies is the basis on which they are able to use the TUSC name on the ballot paper. TUSC stands 179 candidates in the local elections on 5 May, polling a combined vote of 26,765. ■ A second TUSC conference of the year is organised on 16 July. As well as discussing future electoral plans, the conference agrees proposals to include the TUSC Independent Socialist Network as a constituent component of the national steering committee to represent individual members. ■ The 2012 election conference is held on 28 January, agreeing a challenge in the English and Welsh local elections and the London assembly elections on 3 May. There are 120 council candidates in England, 14 in Wales, and 38 organised separately by Scottish TUSC for the local elections there. The TUSC candidate for the Liverpool mayor, former Liverpool 47 councillor Tony Mulhearn, polls 4,792 votes (4.7%), coming in fifth ahead of the Tories and with double the UKIP vote. The combined vote of all TUSC candidates is 46,816. ■ The RMT AGM in June supports a motion congratulating "all RMT members who stood as TUSC candidates, or whose branches or regional councils supported TUSC candidates, for contributing to the hard, long-term task of rebuilding political representation for working class people" and agrees that the union should be officially represented on the TUSC national steering committee. POA general secretary Steve Gillan, assistant general secretary Joe Simpson, and FBU NEC member Ian Leahair also join the committee in a personal capacity. ■ A further TUSC conference is organised on 22 September, which includes a platform speaker from the CPB. The CPB is again invited to join the steering committee but, while looking to collaborate with TUSC, decides in November that they will still not formally participate in the coalition. Later in the year Socialist Resistance are invited to a steering committee meeting to make their case to be represented on the committee. A TUSC Structure Review Commission open meeting to discuss proposals to improve the coalition's functioning is held on 15 December. ■ A TUSC Trade Union Forum is organised on 6 April, attended by 19 NEC members and senior officers from eight unions. Socialist Resistance are accepted onto the steering committee, although for a probationary period without having the right to veto decisions under the committee's 'consensus rule'. In the mainly Tory county council local elections on 2 May, TUSC stands 121 candidates, polling 10,182 votes. ■ Over the summer the RMT hosts three meetings to discuss a challenge in the 2014 European elections embracing the different organisations involved in the 2009 No2EU coalition and TUSC. The main organisation that was involved in 2009 that had remained outside TUSC was the CPB so another approach is made to invite them onto the steering committee with full rights. By August however it is clear that they are insisting on a separate European election coalition so it is agreed at the 4 September steering committee that TUSC will not contest the Euro-elections in its own name and leave it to constituent organisations to decide whether or not they will support the re-established No2EU electoral list. ■ TUSC enters discussions with two 'rebel councillors' in Southampton who have been expelled from the Labour Party for opposing the closure of a swimming pool in their ward and the general austerity policies of the Labour-led council. TUSC is also contacted by a group of eight former Labour councillors in Harrow to discuss the possibility of joint work. ■ The TUSC conference is held on 1 February, with attendees including councillors from Harrow, Rotherham and Southampton. With Labour's special conference endorsing the Collins Review proposals to further reduce trade unions' collective rights within the party, TUSC agrees to make a particular appeal for active trade unionists to stand in the forthcoming local elections. Following Bob Crow's tragically early death on 11 March, 53 RMT members stand as TUSC candidates in the elections on 22 May. They are part of the biggest left-of-Labour electoral challenge since the immediate aftermath of world war two, with 559 candidates together polling 68,152 votes - including ten councils where TUSC scores over 2,000 votes. ■ Two councillors in Leicester leave the Labour Group to form an Independent Councillors Against the Cuts official council group, which subsequently becomes part of the Leicester TUSC steering committee. Two rebel councillors expelled from the Labour Party in Hull also approach TUSC to discuss joint work on preparing a no cuts budget. ■ The RMT AGM in June unanimously agrees that the union "will continue to participate as a founding element of TUSC with representation on the TUSC national steering committee"; "will continue to support TUSC candidates in local and national elections under rule"; and "encourages RMT branches to consider standing members as candidates in the forthcoming general election". ■ In September places on the TUSC national steering committee are agreed for two representatives of the group of TUSC supporters on the NUT executive. Socialist Resistance, however, step down from the committee, citing their 'heavy involvement' in the Left Unity party. This was set up in 2013 by, amongst others, the film director Ken Loach. Despite being offered a place on the TUSC steering committee with the full rights of a constituent organisation, Left Unity decides not to participate in the coalition. ■ The Scottish TUSC steering committee meets on 9 December and approves its first seven candidates for the forthcoming general election. ■ A 300-strong TUSC conference to discuss the 2015 elections is held on 24 January, addressed by rebel councillors from Hull, Leicester, Walsall and Warrington. The national steering committee meetings in February and March process over 750 applications to be candidates for the general and local elections, approving the big majority but not accepting parliamentary candidacies in seats where the RMT executive separately endorses the Labour or Green Party candidate. TUSC also registers a joint description with Left Unity to enable any of their candidates who wish to contribute to a broader electoral challenge to do so, while retaining the Left Unity name on the ballot paper. In the event seven of the ten Left Unity parliamentary candidates take up this option. ■ 748 TUSC candidates contest the 7 May elections, polling 118,125 votes in total. But while having 135 parliamentary candidates means TUSC reaches the threshold for 'fair media coverage' - and a TUSC party election broadcast goes out in April (see https://www.youtube.com/watch?v=pcEMrCTVRdg) - coverage is strictly at the statutory minimum. Nevertheless, TUSC local council candidates poll over 3,000 votes in seven councils and over 1,000 votes in a further 17. ■ Following the general election Labour holds a leadership contest. Two weeks after the winner is announced TUSC meets in conference on 26 September to discuss Jeremy Corbyn's welcome victory and the new situation that has opened up. A revised local elections policy platform is agreed and a call made on TUSC supporters to approach Labour councillors to discuss the new possibilities for anti-austerity action, while recognising that Jeremy Corbyn had only received the public support of 450 out of Labour's 7,000 local councillors. On 19 October representatives from TUSC and the Labour Representation Committee (LRC) national committee meet for exploratory talks on how the inevitable reaction by the capitalist establishment to Jeremy Corbyn's victory could best be combated, in the labour movement and in society at large. ■ The September TUSC conference had also agreed after a full debate that TUSC will campaign for a leave vote in the referendum on EU membership scheduled for 2016, while preserving the right of those in TUSC who support EU membership to publically present their own position. It is agreed that TUSC will not back any leave campaign headed by Tory or UKIP politicians but will campaign on its own core policy platform of opposition to austerity and support for socialist policies. The 25 November steering committee meeting agrees draft wording of a petition to the Electoral Commission demanding they use their legal power not to choose an official Leave campaign at all "if there is not one organisation that adequately represents those supporting a particular outcome to the referendum". Neither the Vote Leave nor Leave.EU campaigns, TUSC argues, should get the public resources and profile that official designation would give them. ■ In January Unite's Local Government National Industrial Sector Committee agrees a resolution calling on Labour-controlled councils to use their reserves and borrowing powers to set no-cuts budgets, using TUSC-published research on council reserves. In February Unison's Local Government Service Group Executive makes a similar call. The TUSC steering committee publishes a comprehensive briefing pack, Preparing a No Cuts People's Budget. ■ The 'Don't give taxpayers money to UKIP and Tory EU campaigners' petition is launched in February with the signatures of two national union presidents, two vice-presidents, and 26 national executive committee members. In March the PCS NEC supports the call on the Electoral Commission to not designate any group dominated by UKIP, Tory and other pro-austerity and racist politicians as the official Leave campaign. The Commission is due to decide on 13 April but refuses to discuss the option of not making a designation, stating instead that "it is of course open for TUSC itself to apply for lead campaigner status". So to keep the pressure on them TUSC does apply - in what the BBC calls "a surprise bid" - but, exposing the political bias of the Commission, it goes ahead anyway and without any further correspondence with TUSC appoints the Boris Johnson-fronted Vote Leave as the recipient of millions of pounds of public funds and guaranteed media coverage. ■ In the new political context of Jeremy Corbyn's leadership of the Labour Party TUSC adopts a more targeted approach to the elections on 5 May. TUSC candidates poll 43,309 votes in total, including 3,540 votes for the six constituency seat candidates for the Scottish parliament, while the Liverpool mayoral candidate, Unison NEC member Roger Bannister, increases TUSC's support from 2012, winning 4,950 votes (a 5.1% share) and coming in fourth, ahead of the Tories once again. ■ From the end of May to the 23 June EU referendum a TUSC '20-city tour' of public meetings takes place under the heading, 'The Socialist Case Against the EU' (eventually 25 cities are covered). There are platform speakers from the TUSC constituent organisations, including RMT general secretary Mick Cash at the London leg, and other labour movement speakers supporting a leave position, including BFAWU president Ian Hodson and FBU NEC member Paul Embury. ■ The government's defeat in the EU referendum triggers a crisis in the Tory party but also a leadership coup attempt by the Parliamentary Labour Party. The RMT AGM, meeting from 26-30 June, gives resounding support to Jeremy Corbyn to continue as leader of the Labour Party. At the same time it agrees to continue participating in TUSC to ensure that the union will not be trapped into supporting alleged Labour politicians who vote for austerity and war, for lack of an alternative electoral vehicle to use. ■ Following Jeremy Corbyn's re-election as Labour leader the TUSC steering committee meeting on 12 October initiates a discussion on TUSC's role now, including the question of electoral strategy, in preparation for the 2017 elections conference. It also agrees a new procedure for individual members' representation on the steering committee, who will now be elected by those who attend the national TUSC conference who are not otherwise members of a constituent organisation. ■ The TUSC conference is held on 28 January, with the main debate under the heading 'TUSC's role now and the 2017 elections'. The conference agrees to continue contesting local elections but to insist that prospective TUSC candidates seek a dialogue with the Labour candidate on their preparedness to resist cuts to council jobs and services before their candidacy is approved. A Scottish TUSC conference is held on 25 February to agree plans for the Scottish local elections. However, in March the SWP suspend their participation in the TUSC steering committee in disagreement with the plan to stand in the council elections in England and Wales (while supporting candidates in the different political situation in Scotland). ■ TUSC stands 78 candidates in the Scottish and Welsh council elections and the English county council elections on 4 May, plus two mayoral candidates, polling a combined vote of 15,407. During the campaign Theresa May makes her surprise announcement of a snap general election, cutting across the council contests. ■ Meeting on 10 May, the TUSC steering committee agrees that it will not stand candidates in the 8 June general election but will work all out to try and get Jeremy Corbyn into Number Ten. In contrast to the prevailing media talk after the local elections of a 100-seat Tory majority the TUSC press release argues clearly that "the election outcome is not a foregone conclusion". ■ Following the surge of support for Jeremy Corbyn at the election the RMT AGM at the end of June agrees a branch consultation on whether re-affiliation to the Labour Party would help the union pursue its goal to "create a mass party of labour that fights in the interests of the working class". The union will approach Labour for answers to questions on its' democratic structures, the rights of unions within the party, and what it will do about 'Labour' councillors and mayors who continue to implement Tory austerity policies. The AGM also agrees policy for local authorities to use their reserves and borrowing powers to set legal 'No Cuts Budgets' that protect public services and jobs while fighting for more government funding. ■ The TUSC steering committee meets three more times in 2017, releasing a report on the level of reserves held by the 124 Labour-led councils across Britain and organising a survey on how far Labour councillors are preparing to back Jeremy Corbyn's anti-austerity message in the next round of council budget-setting - the first since the general election produced a weak and feeble Tory government which would not be able to defeat concerted resistance to its cuts policies if Labour councillors were prepared to fight. ■ The TUSC conference meets on 10 February and agrees a motion calling on the steering committee "to continue with the broad electoral approach adopted since September 2015" for the local elections, "but ensuring that no candidates are authorised to stand against consistent public supporters of Jeremy Corbyn and his anti-austerity policies". The resulting electoral stand on 3 May was the most selective taken in TUSC's history, with 112 candidates polling a combined 14,073 votes. The national steering committee member Keith Morrell is re-elected in his Southampton council ward with a 46.9% share of the vote. ■ A special general meeting (SGM) of the RMT is held on May 30 to discuss a formal invitation from the Labour Party to re-affiliate. The SGM decides by 31 votes to 25 not to re-affiliate at this stage but instead continue with its current political strategy, acknowledging in the agreed motion that Labour "has the potential to be a mass party of the working class" since Jeremy Corbyn's election to the leadership, but that the RMT can best "support, defend and develop the socialist advances that have been made" through its own independent political activity. The current political strategy includes retaining RMT representation on the TUSC steering committee and supporting candidates that support the union's policies.